King’s Canyon, the Apex Legends map upon which we all drop time and time again each match, is filled with a remarkable array of cliffs, loot-filled towns and hidden areas. 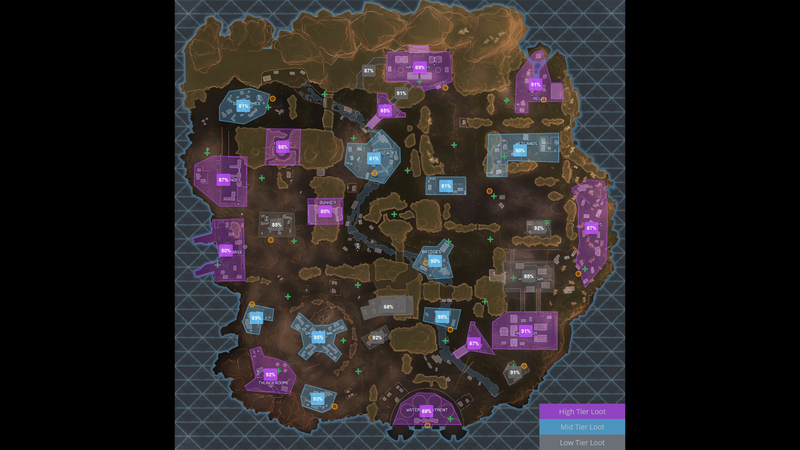 Despite its small size, there’s an awful lot to learn about this map and its locations, so we’ve put together this Apex Legends map and locations guide for King’s Canyon, with detailed info on loot tier chances, as well as tips and opinions on a multitude of landing spots across the map. So let’s start Season 1 off well with the most up to date tips and info on the most popular locations across the map! Click on the above image to view it at full resolution. If you’re looking for a primer on how finding loot and gear actually works in Respawn’s battle royale, head over to our Apex Legends loot for all the information you need. In fact, while you’re here, why not check out our main Apex Legends tips/guide? We’ve got tonnes of beginner-friendly tips and explanations, along with more advanced tips and info such as weapon stats and spray patterns in our Apex Legends guns/weapons guide, or how to play as any of the various Apex Legends characters. Apex Legends currently has just the one map, called King’s Canyon – though Respawn have confirmed that they will be adding more as time goes on. Season 1 has brought no recognisable changes to King’s Canyon, so thankfully none of our favourite landing spots have been altered or removed. The whole map is much easier to traverse than the maps of many other battle royales, partly because of the map’s smaller size (we’ve worked it out to be around 1,925m2) and partly because you can move about and reposition very quickly in Apex Legends. Each of the 17 named locations across King’s Canyon (and many of the smaller unnamed areas too) contain different qualities of loot, from weapons and armour to consumables and attachments. Because Apex Legends is still in its early stages of release, everyone is still clamouring to figure out exactly where to go for the highest chance of getting the best loot every match. So let’s take a look at how loot tiers work in Apex Legends, as well as some specific named locations and what they have to offer. When you visit a location for the first time each match, its name will pop up beside your minimap in the top-left corner of the screen. Underneath the name, there will be an indication of the loot tier for this location for this match. In the example below, I landed at Market with my team, and it contained mid-tier loot for that match. I say “for that match” because it appears that the loot tiers are somewhat randomised. However, there is a lot of contention regarding this point among the Apex Legends playerbase, mostly because it seems that each location has a likely loot tier which only sometimes deviates to a different tier. Take a look at the Loot Tier Map below, which is a work-in-progress crowdsourced loot map found over at apexmap.io. Players can vote on the areas that land and input what tier of loot they received. As a result, as time goes on and more players vote on each location, this loot map and the probabilities indicated will only become more accurate. 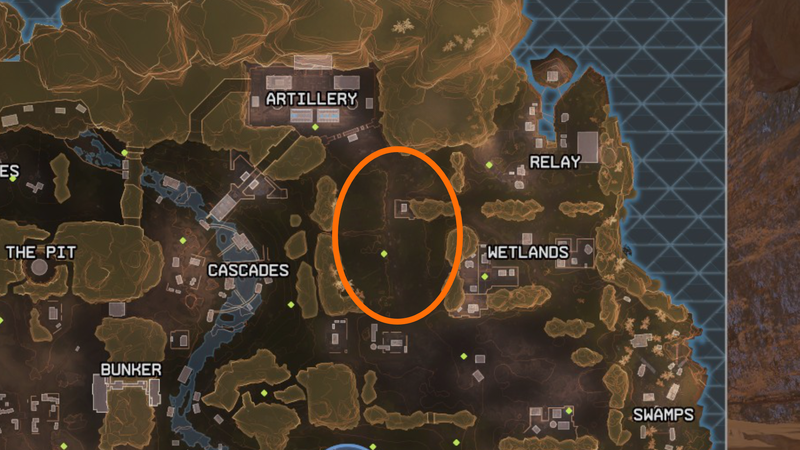 There are various unique aspects of the Apex Legends map that gives you a better an idea of where to go for the best loot, from the Hot Zone which spawns over a different area each match to the Supply Ships which periodically spawn and fly across King’s Canyon. For full details on everything loot-related, check out our Apex Legends loot guide. 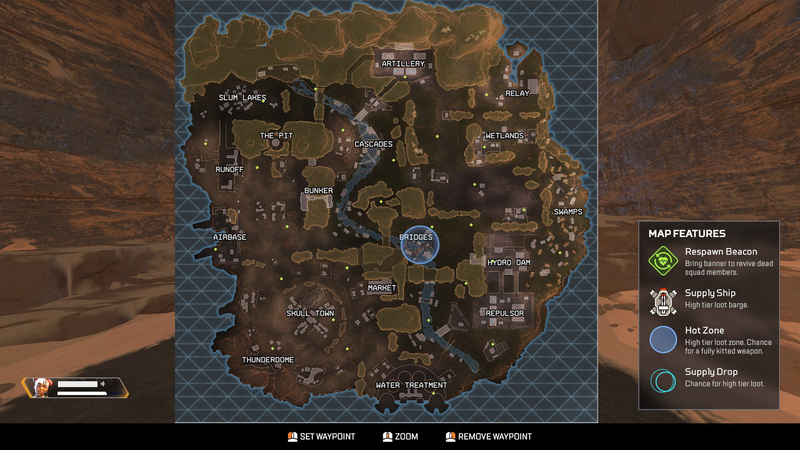 Now let’s take a look at some of the locations across King’s Canyon in Apex Legends, and compare them to one another in terms of position, size, loot quality, and any other factors worth considering. As time goes on we may flesh out this list to contain every named location, but for now here are some excellent landing spots for you to explore in your matches. Note: The amount of time you spend in a location depends largely on the position of the Ring, which will reveal itself to you within the second minute of each match. For full details on the Ring and its behaviour over the course of a match, check out our Apex Legends Ring guide. Artillery is a popular area at the far north of the map. Quite large and filled with high-quality loot nine times out of ten, it’s a dangerous hot drop filled with large buildings that can take perhaps a minute or more to fully explore. Ziplines in the roofs of the largest buildings allow for quick travel in and out of danger, and the tunnel to the west offers a loot-filled alternate pathway out of the area once you’re finished. You’ve also got the area south of Artillery which, while it looks on the map like a vast expanse of nothing in particular, contains a great deal of supply crates – more, in fact, than in Artillery itself! So if Artillery turns out to be too hot for you (or a team beats you to the ground there) an excellent option is to land just south, loot up, and take them on once you’re ready. For more information on different Supply Bin locations, check out our Apex Legends loot guide. Relay’s downfall is that it is in the very top-right corner of King’s Canyon, and you’ll often find yourself having to head central sooner in order to avoid being hit by the damage-dealing Ring that steadily encroaches across the map. However, for teams looking for a slightly quieter early-game, Relay comes packed with high-quality gear most of the time and you’re unlikely to find too many other players – perhaps another team, no more than that. Be aware also that you can get onto the tiny island to the north and back via two ziplines. Don’t skip the house on that island, because we’ve found it often contains some great stuff. Our first mid-tier-loot-heavy location, Skull Town is still a great place for a team to land because it’s big enough for a team to leave equipped with decent enough gear to defend themselves. It’s fairly central and easy to rotate to different nearby locations such as Market, Thunderdome, Airbase and Water Treatment. It’s also an excellent alternative to Thunderdome, which, while it often (supposedly) contains higher-tier loot, is so spread out that it takes a long time to loot and will often result in a split party. Skull Town has the benefit of being compact, and will help to keep your team together as a single unit. However, it is almost always the target for at least one or two other teams, so loot quickly and prepare for an early fight if you go there. Another high-tier-weighted location, Repulsor is very similar to Artillery (even going so far as to have the same style of buildings) but actually has more buildings than Artillery, as well as an underground tunnel system which contains floor loot and offers an excellent method of escaping or initiating during fights. It’s also connected to Hydro Dam to the north, which rarely contains good loot but is still often used as a landing area for at least one team, so keep an eye in particular on your northern side while you’re looting up in Repulsor. I prefer to head south first, to the small cluster of buildings below Repulsor, before heading into the next Ring. Slum Lakes is a heavy concentration of tiny houses packed into the far north-west corner of the map. It almost always contains mid-tier loot, but the benefit of Slum Lakes is that you can pass extremely quickly from one house to the next, and as a result you’re pretty much always protected and covered from all sides while you’re looting. There’s also a line of buildings embedded into the cliffs to the north-east of Slum Lakes which you can loot once you’re finished with Slum Lakes proper, and although it is not exactly a central location there’s always a hot air balloon on the east side of Slum Lakes that you can use to travel quickly to the rest of King’s Canyon. As a general rule, rivers in battle royale maps are a death zone. Difficult terrain and surrounded by high ground from which enemies can snipe down at you without warning, if you want to land here you’re going to want an easy way out. This is what Bunker provides – filled with high-tier loot, you can pass right under the massive cliff there and through the underground complex to the other side, where you can easily rotate over to Airbase, Runoff, or The Pit – all of which incidentally, pretty much always have high-tier loot as well. I was actually amazed looking at the above loot map, because every time I’ve landed at Market it’s always been mid-tier loot rather than low-tier. But regardless, while it doesn’t necessarily have the best chance to find purple or gold gear, Market is a good central location from which you can rotate in any direction once you’ve looted up. The massive Market building alone often has enough weapons to kit out a team of three, and after that you can head over to the smaller buildings to the west and then the south. Much like landing in Slum Lakes with its tiny compacted houses, landing in the Market building has the benefit of isolating you from the rest of the map until you’re good and ready. But be warned – there are only a couple of doors to this massive building, so it’s often better to use the ziplines up to the roof in order to reposition yourself if threatened by an enemy team. Airbase is located on the west coast of the King’s Canyon island, and is more often than not packed with high-quality loot. It exists in its own little bubble separate from the map due to the massive dam that cordones the area off from everywhere else. There are several areas on the coast where you can find clusters of loot crates, making for excellent areas to hit the ground; and be sure to check the interiors of the ships docked here, because they often contain the best loot in the entire place. That’s everything we’ve got for now on the packed and fascinating Apex Legends map that is King’s Canyon. Check back soon for even more information and top tips on the different locations in Apex Legends. Until then, why don’t you let us know your go-to landing spots in the comments below?